……And the 2012 Wisconsin CCA of the Year is!!!!!!!!!!!! Cyndi Heath! Cyndi is one of the lead Agronomist for Black’s Valley Ag Supply , Durand. Cyndi was nominated by Hannah Brion and coworkers because of her professionalism and work ethic. She consults with almost 100 dairy and cash grain producers making crop, nutrient and pest management recommendations. Cyndi also has a background in Animal Science and does ration balancing work as well. She assists with the management team at Black’s Valley Ag Supply making important business decision anywhere from human relations to finances. According to Hannah, “Cyndi is a strong team leader, especially during the chaos of the spring, she is the glue that holds the team together”. Quite an endorsement when it comes from your coworkers! In addition to formulating crop recommendations, Cyndi is involved with writing Nutrient Management, Comprehensive Nutrient Management and Pest Management Plans for CAFO’s as well as writing their NR243 plans. Cyndi was even invited to speak at Canada’s Tri-Provincial Manure Applications and use Guidelines Training event and has been a member of the Wisconsin’s Department of Ag Trade and Consumer Protection’s Quality Assurance Team. 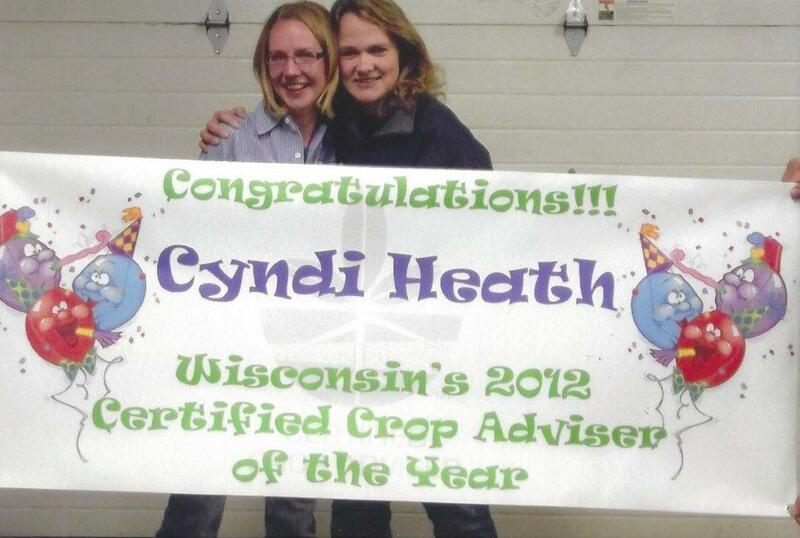 Cyndi’s is a proponent of education and wants all agronomists to be certified because she realizes the value of being a CCA and establishing credibility. She is a multi-tasker at work and in the community. The next time you see Cyndi make sure you congratulate her on a job well done!